In this case, the source of live is video. This feature allows you to schedule VOD broadcasting, e.g. for creating webinar automation or web TV channel. To start you should press “Streaming video as a live”. 1. Start stream. When you press this button, pop-up menu appears where you chose VOD for streaming. Live begins immediately. Also you can loop playing live, to do that press “loop”. If you choose loop option, you can’t add any more VOD to this live. 2. Stop. Pressing this button stops active live. If you scheduled streaming several VOD in one live, they will start by time. Attention. When you stop live, then you can’t continue from the moment of stop. To start live one more time, you should add VOD to live once again. 3. Schedule live. When you press this button, new window opens. There you choose VOD and time to start streaming. Attention. Start time and stop time of live is UTC+3. You can’t schedule streaming of different VODs on the same time in one live. To stream different VODs simultaneously you should create different live streams. 4. Publish. You get direct link and iframe code for publishing. There is autostart option – player with Live starts when web page is opened, provided Live is active at the moment. Hide title – this option hides title of live and viewer see only play button. 5. Covers. 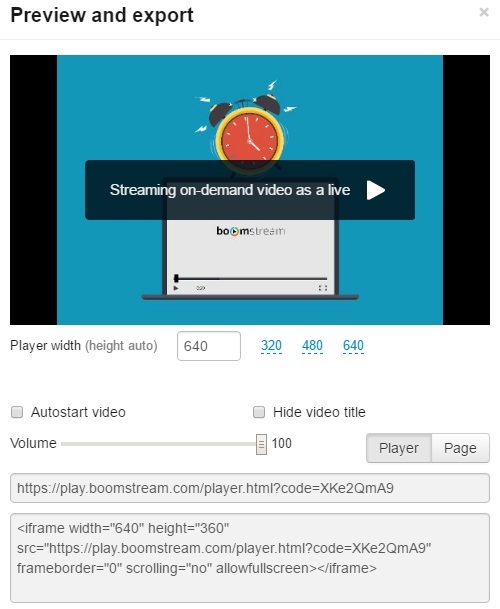 When you add VOD to live, Boomstream will make several screenshots. You can set screenshot as a live cover or upload your own picture and set it. 6. Statistics. Information about viewing and broadcasting your live. 7. Information. Description of your live.